National Park Service officials have re-opened parts of Yosemite that have been closed ever since the Rim Fire tore through large swaths of the park last summer. Visitors can now return to the Tuolumne Grove of Giant Sequoias and to hiking trails near Hetch Hetchy, among other areas. Park officials caution visitors to be careful in burned lands, however, as these areas can still be dangerous, with uneven ground, debris on trails, hazardous trees and the potential for falling rocks. The Rim Fire burned more than a quarter of a million acres, including about 77,000 acres inside Yosemite National Park, leaving a stark and denuded landscape of dead trees. Park closures during and after the fire crippled businesses that cater to visitors from around the world. "With the opening of these closed areas and looking at a good year,” said park ranger Scott Gediman, “we're hopeful that a lot of those businesses can rebound and do well." Fire ecologists say it will take decades for the forests to recover, both because of the extent of the burned area and because of California’s drought. The Rim Fire started in the Stanislaus National Forest on August 17, 2013, when a hunter’s illegal fire got out of control and raged through forests thick with dry trees and brush. 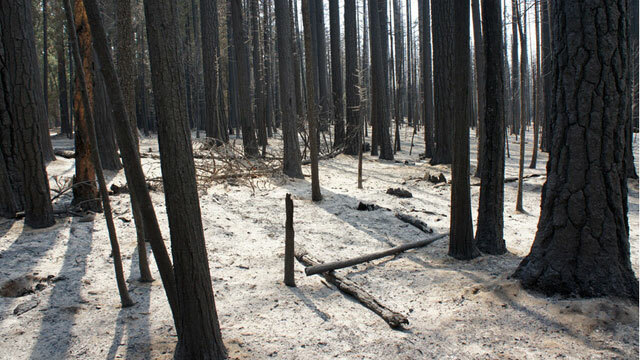 The photos below show the same location in the Stanislaus National Forest before the fire, and about two weeks after it. Fire scientist Scott Stephens of the University of California, Berkeley, was measuring plots and taking a timber inventory with graduate students when the fire forced them to evacuate. Stephens said when he returned to the area in late September, he had to locate it using GPS, as it was so changed he couldn’t recognize it. Drag the slider back and forth to compare before and after shots. In the first "before" photo, a lone California black oak pokes gnarled branches into the sky amid a stand of conifers. Stephens said the black oak is important for wildlife, both for its acorns and for the cavities it creates where birds and small mammals nest. The next picture shows a downed sugar pine log, with a small dead tree laying across it. The "after" photo shows the shrunken, scarred remains of that small tree. The final picture shows how the fire cleared out the dead sapling in the foreground.